Bygone Living: B&B Friday (4/9/10)! getting the hankering to "get away" lately. I've simply been away from New England too long! Oh, well. Guess I'll just have to wait until June! "Nestled in New Hampshire’s White Mountains, Sugar Hill Inn is a romantic getaway known for culinary adventure and warm, inviting guest rooms and cottages. 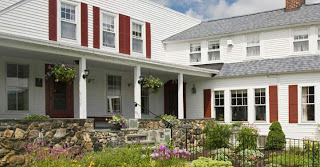 You’ll be immersed in country inn ambiance, New England hospitality and all the recreation of the Franconia region. 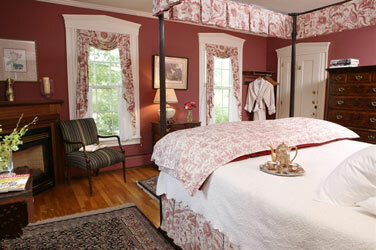 Impeccably restored, this country inn ranges from charming and cozy to sophisticated and distinctive. Whether you seek a convenient base for the many wonderful attractions and outdoor activities of Franconia Notch and the White Mountains or a special private hideaway to snuggle in front of a fireplace…come share the good life at the Sugar Hill Inn…your destination of choice." Relax in the tranquility of this historic Inn amidst five acres of park-like grounds (set back off the street, away from the hustle and bustle). Stroll down our winding driveway and cross the street to enter the charming Lenox Village. More than just a Lenox bed and breakfast, we are an elegant Inn with four-star amenities. Experience our staff's personalized service; pamper yourself with a massage in our dedicated spa treatment room; swim in the Olympic-size pool and dine on delicious food. All rooms have private baths, AC, spa robes, Aveda products, free WiFi and iPod clock radios. Our guests enjoy complimentary snacks, beverages and afternoon sherry in addition to our sumptuous breakfast buffet including cooked-to-order specialties." 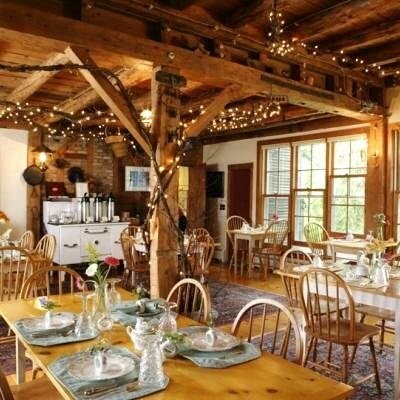 "The Round Barn Farm is so much more than a Vermont Bed & Breakfast. It’s the perfect destination to discover the joys of a Mad River Valley getaway and rediscover romance and relaxation. Our luxurious New England Inn feels like home the moment you step inside -- with all of the comforts but none of the demands! Located amidst 245 acres of majestic mountains, meadows and ponds in the unspoiled Mad River Valley, The Round Barn Farm is home to year-round Vermont vacation activities, arts, culture, and a warm and welcoming community near the Sugarbush and Stowe ski areas." I love the Round Barn Farm. If you ever have the chance to visit, definitely go there! The place is amazing and the setting is so beautiful. I also think that the Round Barn Farm looks wonderful. I like the restaurant area. Oh my gosh...who wouldn't love each and everyone of these B & B??? Keep them coming..we may just have to consider one of these one day!! I love the fruity breakfast set-up at the Sugar Hill Inn. It makes me so hungry for our summer fruits! we sure do love the same things..are you sure were not sisters? I think I like the second one best. I hope you get to stay in them all someday. Found your blog today and really enjoyed getting a little visit in New England, *sigh* just lovely.